The unique, brass–clad Medway building designed by RMJM has won a 2008 Civic Trust Award. It was praised by the Civic Trust judges as “the flagship building for the University of Kent.” They further praised it for being ‘visually striking with a high attention to detail’, an important consideration given the building’s location within a potential UNESCO World Heritage site. The judges felt that the use of brass cladding was well suited as it ‘complements the brick of the nearby historic buildings’. The Medway Building was opened in 2005 by Dame Kelly Holmes and it signalled the arrival of the University of Kent at Medway – a joint venture campus between the Universities of Greenwich, Kent, Canterbury Christ Church and Mid–Kent College. 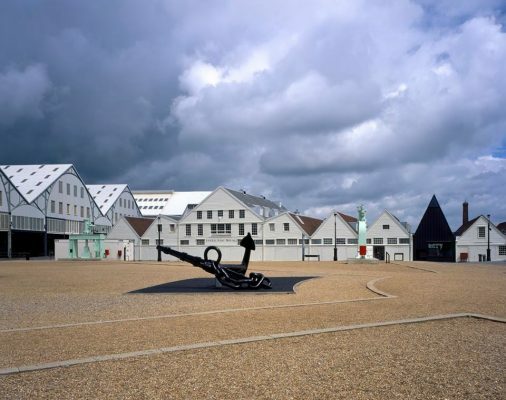 RMJM designed the overall masterplan for the new campus which is close to the Chatham Maritime Dockyard. They had a challenging brief to build a modern, forward–looking image for the university whilst respecting the historic context of the site, its naval tradition and its existing buildings. Medway was the first of the new buildings that RMJM designed, closely followed by the award winning Drill Hall Library and Pilkington Building. Apart from its unusual exterior walls, the Medway building was also praised by judges for its environmentally friendly features, including passive south facing solar shading, and insulated walls behind the brass contributing to the building’s heating and cooling strategies. The building now accommodates many of the University’s state–of–the–art facilities, including recording studios used by Music Technology students, and sports laboratories run by the Centre for Sports Studies. This Civic Trust Award continues a healthy track record of design recognition the Medway Building has received so far: In 2006 it won a top prize at the inaugural Medway Design Awards for Best New Building, and was shortlisted for a Royal Institute of British Architects (RIBA) Award. Other honours include a commendation at the Royal Town Planning Institute (RTPI) Awards in 2007, and a nomination for Best Public Building at the latest Kent Design Awards.